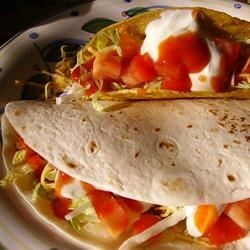 "Very quick and easy way to make meat for tacos, or served over rice. My husband loved this -- it was a last minute meal idea!!! Enjoy!!" Average recipe. Easy to make, but the pre-mixed taco seasoning has loads of salt. I would suggest making your own spice mixture and using that instead. forget the katchup, use salsa instead its amazing!! It was just too sweet... and I didn't even use as much ketchup as it called for. The next time I make this I'll only put in 1/8 cup of ketchup. Pretty good and super easy! Could use a little something though, maybe next time I will add a little garlic and salsa to the mix.